Berry shrivel in Cabernet Sauvignon is influenced by climate and can negatively affect wine flavour and characteristics, a recently completed Wine Australia-funded Incubator Initiative project has found. The findings are important as until now, very little has been known about berry shrivel in Cabernet Sauvignon fruit and the effect of shrivel on wine quality. Berry shrivel occurs when berries suddenly lose weight during the late ripening stage. The condition is attributed to dehydration and loss of berry cell vitality. Not surprisingly, the phenomenon can devastate a grape crop – resulting in losses of quality and yield. In a bad year, yield losses can reach up to 30 per cent. The Limetone Coast cluster of Wine Austalia’s Regional Program proposed the topic for the Incubator Initiative and was a partner in the project that saw Dr Vinay Pagay, a lecturer in viticulture and vineyard engineering at the University of Adelaide, spend a vintage in Coonawarra measuring and analysing Cabernet Sauvignon vines – from row orientation, light levels and plant water status to canopy, bunch temperature and berry composition. ‘My aim was to determine the influence of leaf removal, vine water status and row orientation (east–west versus north–south) on late season berry shrivel,’ Dr Pagay said. He found that leaf removal resulted in higher light interception and temperature in the canopy and bunch zone, while reduced irrigation levels resulted in lower soil and vine water status, and lower berry weight and yield. Reduced irrigation also negatively affected berry cell vitality, resulting in a higher incidence of bunches with shrivelled berries. Dr Pagay said east–west oriented rows had a higher incidence of shrivelled fruit as well as lower berry weight and yield compared to north–south rows. This was attributed to the higher vine water stress in the east–west rows and not necessarily due to row orientation. Sensory analysis of the wines by an expert panel of tasters revealed that inclusion of shrivelled fruit increased the perception of dark, jammy and oxidised characters, while ‘clean’ fruit had greater red berry and green characters. 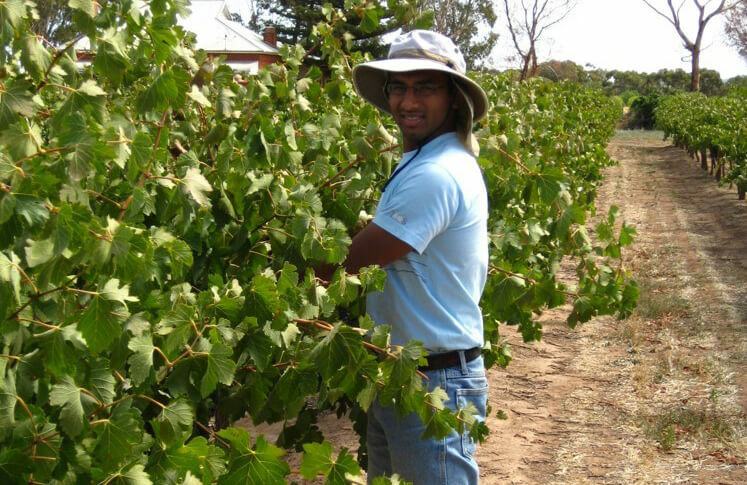 ‘Vine water stress – higher in the east–west rows compared to the north–south rows – exacerbated the incidence of shrivel and likely also the proportion of shrivelled berries on each bunch, consequently increasing the jammy and cooked fruit characters observed in the wines’, Dr Pagay said. Dr Pagay said the findings had major implications for growers, as climate change continues to have an impact on Australian viticultural regions. Dr Pagay said it was important for growers to consider their particular climate when planning new blocks or rejuvenating their vineyards. Dr Pagay is already planning out the next phase of his research project – a partnership between Wine Australia and the University of Adelaide. ‘We now want to look more closely at how using shrivelled grapes in wine blends affects the taste and quality of the end product.